There are several financial incentives provided by the governments for setting up infrastructural facilities for milk production. The tenth plan outlay for animal husbandry and dairying was Rs. 2500 crores. The National bank for Agricultural and Rural Development (NABARD) assists farmers with loans and refinancing facilities for dairy farming. The interest charged ranges between 12% to 13% depending on the amount of loan taken. Loans are to be repaid in monthly installments usually within a period of 5 years. The demand for milk and its products is active year round. Demand for Milk is increasing day by day. It also does not need skilled labor, thus reducing costs and making availability of labor easy. Besides, like other agricultural sectors, Dairy is not dependant on rains and production goes on year round. There is no direct competition from the foreign counterparts. However, in India, farmers carry on dairy activity secondary to their main agricultural activity. In addition, dairying is carried on in a traditional manner as was being done by past generations. A small shed with good cross ventilation is enough to keep a small herd. Litter height should be atleat 6cms. Litter material maybe of sawdust, paddy husk and groundnut shell. The litter material has to be turned periodically to remove the foul odour in the pen. Litter material should be replaced once in every 2 weeks. Each goat requires about 15 sq.ft area. Care should be taken to reduce the external parasitic infestation. 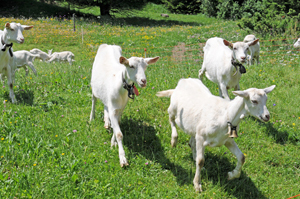 An adult goat produces about a tonne of manure in a year. The milk production in India is still among the most competitive in the world. In fact, experts say, the Indian dairy sector is poised for consolidation, higher efficiency and growth with the entry of big players. According to industry data, India's milk production accounts for more than 15% of the world's output and 40% of Asia's. It also has been growing at 4% per annum, far above the global average of 1-2% in recent years. Already, corporate majors, including Reliance, ITC, DCM, Bharti, Coca-Cola and PepsiCo, are in the sector, anticipating big growth in the near future. 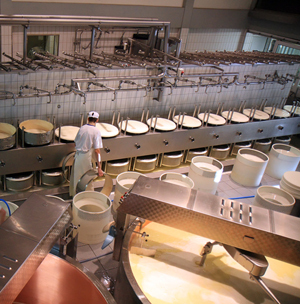 Dairy India projects that the Indian dairy market will more than double to Rs 520,000 crore by fiscal year 2011. The growth, sector monitors stress, represents a big opportunity for multinational food and dairy companies as well as input suppliers. It will help them to expand their exports, facilitate technology transfer, sign new joint ventures and make profitable investments in India. According to the FAO Food Outlook released in June 2009, world production of milk was estimated to be 688 mt in 2008, about 1.7% higher than the previous year. Milk production for 2009 is estimated to be 699 mt, 1.6% more than last year. This growth is below the global trend rate of 2% pa prevailing in the previous decade, says an article on "Market Efficiency: Key to the Indian Dairy Sector" published in the February 2010 souvenir of the Bangalore Dairy Industry Conference. Currently, more than half of India's total milk production is consumed in urbanites, whose population is projected to cross the 400 million by 2011. Today, milk distribution networks serve some 1,500 out of 5,000 cities and towns in India. The entire dairy sector would need to invest heavily in a rural milk procurement network and drastically reduce dependence on intermediary milk collectors and transporters.